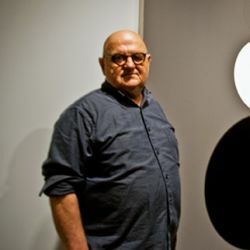 Bob Zoell has had a 45-year art career in Los Angeles. In 1962, at 22 years old, he immigrated to Los Angeles from Canada and 3 years later joined Saul Bass & Associates as Art Director in charge of corporate identity and packaging. One year later, in 1966, he opened my own design and illustration studio and after four years decided to devote all of his time to formal reductive abstract painting. In 1987, he joined Ace gallery in Los Angeles. In 2003 he became interested in Public Art and found it to be a great opportunity to combine his past design and fine art experience and have been working in this field since. He has been the recipient of the Pollack/Krasner and the Adolph Gottlieb Foundation grants. In 2001–2002 he was invited as visiting faculty in painting at U.C.L.A. He has shown his work and lectured in Japan, France, Spain and throughout the U.S. He is also a regular contributor to the New Yorker magazine with 7 covers to his credit. Since 2004 he has been commissioned for public art projects in Los Angeles, San Francisco, Pasadena, Burbank, Denver, New York and Nashville.